Strangely for a Britain where all things German were then loathed, a German word was coined to describe the bombing of towns and cities the length and breadth of the country: Blitz, from Blitzkrieg, or lightning-war. Earlier in 1940 London had been bombed in error by stray planes; industrial cities like Birmingham andLiverpool had been targeted in small raids, but it was not until a British raid on Berlin in retaliation provoked anger there that deliberate plans were made for all-out bombing of London and later of other major population centres, with the express desire of killing civilians as well as hitting strategic industrial and military targets. Thus on September 7 1940 almost 900 German fighter and bomber planes crossed the Channel, and the bomber contingent rained high-explosives and incendiaries down on the Port of London and nearby residential areas. The same night another smaller raid followed this up. 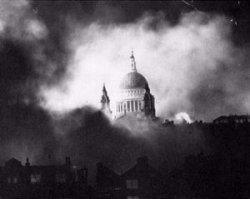 More than 400 Londoners died on the first of what proved to be 57 consecutive days of airborne terror. In the late autumn of 1940 the Nazis extended their targets to 20 or more major cities, towns and ports. By the time the Blitz ended in May 1941 – the last raid of the campaign being on Birmingham on May 16 – more than 40,000 civilians had died; vast numbers of homes had been destroyed; but if anything the Blitz further strengthened the British will to resist. And, vitally, any attraction the American public may have felt towards Hitler and Germany was wiped away by the indiscriminate and callous slaughter of non-combatants.